For AP and PA projections that include both the R (right) and L (left) sides of the body like head, spine, chest, abdomen, and pelvis, a R marker is typically used. For lateral projections of the head and trunk like; head, spine, chest abdomen and pelvis, always mark the side closest to the Image receptor. For example, if the left side is closest use a L marker. The marker is typically placed anterior to the anatomy. If both the R and L sides of the body are included. like spine, chest and abdomen, the side down or nearest the image receptor is typically marked. Example: Left lateral decubitus: R marker is shown. for a right posterior oblique (RPO) position, mark the R (right) side. The R and L marker should always be placed on the side up “opposite the side laid on” and away from the anatomy of interest. Limb projections, use the appropriate R and L marker. The marker must be placed within the edge of the collimated x-ray beam. Limb projections that are done with two images on one image receptor, only one of the projections needs to be marked. If both right and left sides are imaged side by side on one image receptor. Ex. Right and Left AP knees, both the R and L markers must be used to clearly identify the two sides. For AP, PA or Obliques chest projections, the marker is placed on the upper outer corner so the thoracic anatomy is not obscured. Important Note: No matter which projection is performed, and no matter what position the patient is in. If a R marker is used it must be placed on the “right” side of the patient’s body. If a L marker is used it must be placed on the “left” side of the patient’s body. 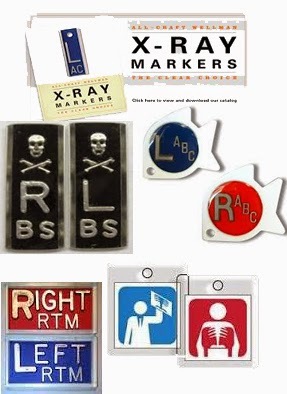 Every radiograph must contain a correct marker that clearly identifies the patient’s right (R) or left (L) side. Medicolegal necessities directive that these markers be present. Both radiographers and physicians must see them to determine the exact side of the patient or the correct limb. ojections done during surgical procedures. Often and unfortunately a radiograph that does not have an accurate lead marker or patient identification will have to be repeated. Marker must not ever be sited over the patient’s ID information. The marker would always be to be found on the edge of the collimation margin. The marker must constantly be located outer of any lead shielding.